I had the opportunity to visit the Library of Congress during Fall Break and took a fantastic tour with a lovely man named Frank. 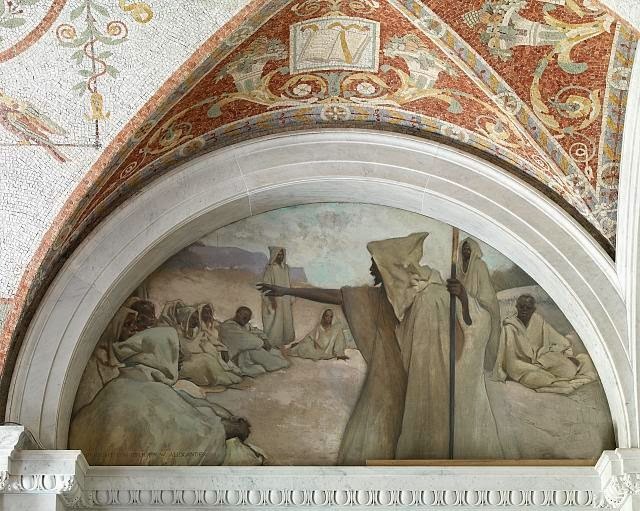 Among the many beautiful works of art that Frank showed our group, the Evolution of the Book murals really stood out. As I listened to him explain their meaning, I thought about how similar the current book evolution period we are living in is to these earlier changes. 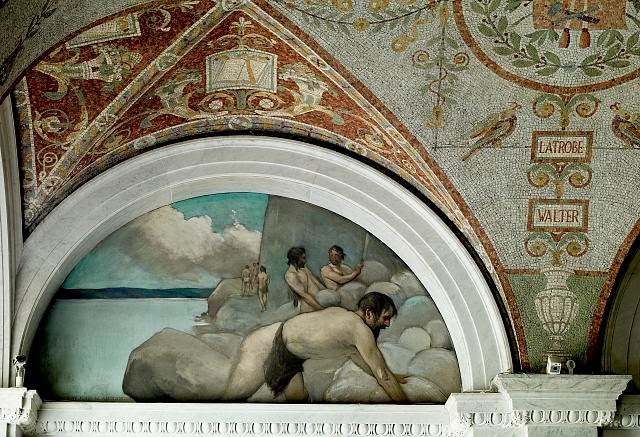 The first mural depicts man before his ability to speak. He is creating a stone memorial to express himself. The urge for self-expression is a primal human desire throughout the ages though the format has changed. The second mural shows the beginning of speech and the oral tradition. A massive leap forward, this evolution allowed people to share with one another their thoughts, feelings and ideas and pass on the history of their culture. 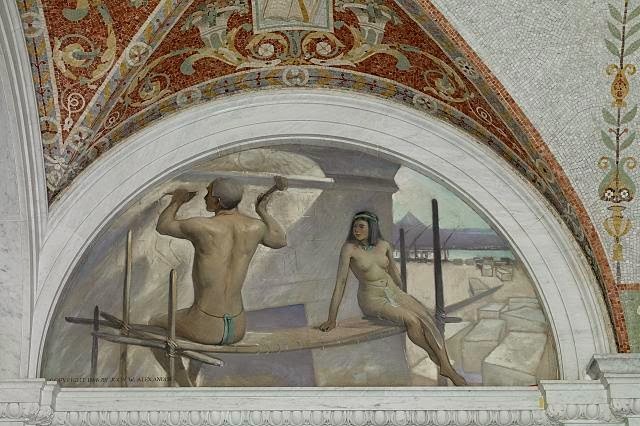 The third mural shows an example of expression with pictures: hieroglyphics. 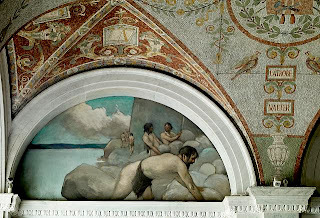 The use of pictures to tell a story increased the ability of humans to communicate complex messages to one another in less strenuous ways than rock piling and more permanent ways than speech. 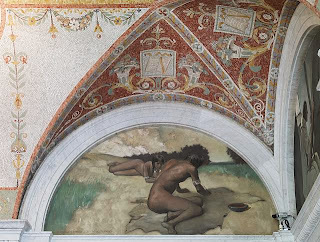 The fourth mural shows indigenous people using hides to capture writing and drawings in a portable and permanent way. For the first time, written material could easily be transferred to others. 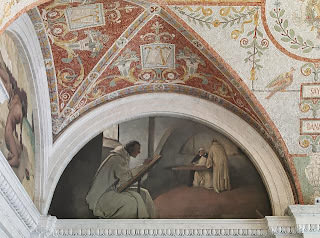 The fifth mural depicts a scholar creating a handwritten manuscript. He is able to set down thoughts to a portable product and again share and communicate thoughts and ideas to an increased audience. 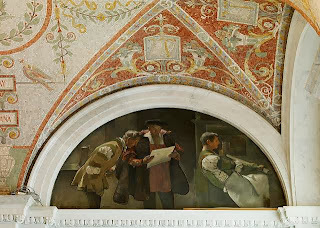 The sixth mural is of Gutenberg and his printing press. A massive step in the Evolution of the Book, printing opened the door for democratization of learning and the sharing of ideas and information across much broader areas. I would offer up another mural today. The next step in the Evolution of the Book is digital. Rather than fear this step or see it as something to be hated, let’s celebrate that the evolution that brought us so much farther in the democratization of learning is continuing. The current availability of information on a global scale is unprecedented in history and rather than run from it, I say run to it! Let’s be glad that more people than ever are able to find the information they need, read it in their languages and enjoy the feeling of getting lost in a great story. I strongly believe that libraries still have a roll to play in this. As a Librarian, I must not insist on a familiar format, but rather be willing to work with my patrons to learn new technologies, provide the best service possible, fulfill needs and steer our library ship through the sea of information. Our students need libraries and librarians more than ever to help them sift through the information available to them and decide what is worth their time. Every student needs access to all these resources through strong and well-funded school library programs with full-time certified School Librarians to run them. I truly believe that the library is the cornerstone of our democracy. How many other places in our society can every single person regardless of socioeconomic status have access to the best research, technology and reading resources available free of charge? In a country that has a lot to learn about sharing, the library brings out the best of our humanity. Whether we support this equal access and continuing democratization of learning will deeply impact the future of our world. So let’s embrace the change and continue to support our libraries as we take this next step in the Evolution of the Book.